"These hearty and filling burgers are made with black beans and rice. Dressed up with a salsa and sour cream sauce, even your meat-and-potatoes man will love them." Mash beans with a fork in a large bowl. Stir in rice, onion, egg, bread crumbs, and 2 tablespoons salsa; mix well. Heat a large nonstick skillet over medium heat; drop bean mixture by 1/2-cupfuls into skillet and flatten to 1/2-inch thickness. Cook until each side is firm and browned, 4 to 5 minutes per side. Combine sour cream and 4 tablespoons salsa in a small bowl. 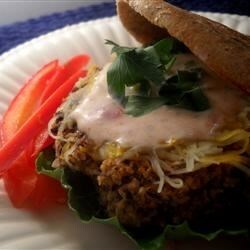 Place a bean burger on bun with a lettuce leaf, 1 slice Cheddar cheese, and top with salsa mixture. Repeat with remaining ingredients. See how to make delicious vegetarian black bean burgers. We was not told where to put the bread crumbs, so I'm assuming they would go in with the beans and brown rice. I love black beans and have never had black bean burgers so I made this and my husband and I liked them. The best veggie burger I've made. Very burger like. I too mixed it in the food processor. Also added chipotle flavored panko. Love it!